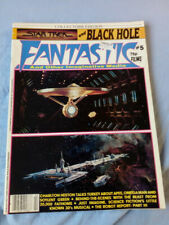 Fantastic Films 5: Star Trek, The Black Hole, Charlton Heston etc. Contains magazine and hand painted Model. STAR TREK: OFFICIAL MAGAZINE #48 EXCLUSIVE COVER! STAR TREK: OFFICIAL MAGAZINE #47 EXCLUSIVE COVER! As sold, folds out to reveal large issue. 1976 issue. No 2 magazine. outer coves ex-. and let's sort it out it all out. and i will always do my best to sort out any problem. hands of a third party. STAR TREK: OFFICIAL MAGAZINE #52 EXCLUSIVE COVER! Fantastic Films issue 42: Last Starfighter, Gremlins, Star Trek III, Indiana Jones, Conan, Buckaroo Banzai. Having a clear out and this was a duplicate. Includes cast prints. STAR TREK: OFFICIAL MAGAZINE #46 EXCLUSIVE COVER! Star Trek Comlink 2 Audio CD. The Audio Magazine of The Official U.K. Star Trek Fan Club. Includes interviews with the cast and crew of the star Trek Universe. Vol 1 No.1 March 1995. Generally in good clean condition. Vol 1 No 11 January 1996. 66 pages content as above. Three used copies of the above magazine all published by Titan Magazines. 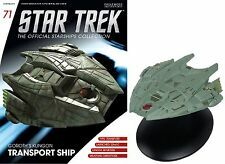 Issue 10 of the Eaglemoss Star Trek official starships collection magazine. The fearsome Borg Sphere. This magazine contains everything you need to know about this massive ship. As the very first magazine in the series this is now extremely hard to come by. Issue 11 of the Eaglemoss Star Trek official starships collection magazine. USS Reliant NCC 1864. This magazine contains everything you need to know about this iconic ship commanded by Khan in the classic Star Trek 2. As the very first magazine in the series this is now extremely hard to come by. Issue 12 of the Eaglemoss Star Trek official starships collection magazine. The Akira class USS Thunderchild. This magazine contains everything you need to know about this advanced starship. As the one of the first magazines in the series this is now becoming harder to come by. Star Trek - The Collector's Edition Magazine Part 48. Star Trek - The Collector's Edition Magazine Part 36. Star Trek Collectors Edition Magazine. Hillingdon Narrowboats Association. Next Generation TNG 38. All proceeds for this sale go to. Star Trek Collectors Edition Magazine. Hillingdon Narrowboats Association. Next Generation TNG 14. All proceeds for this sale go to. Star Trek Collectors Edition Magazine. Hillingdon Narrowboats Association. Next Generation TNG 11. All proceeds for this sale go to. Star Trek Collectors Edition Magazine. Hillingdon Narrowboats Association. Next Generation TNG 18. All proceeds for this sale go to. Star Trek Collectors Edition Magazine. Hillingdon Narrowboats Association. Next Generation TNG 50. All proceeds for this sale go to. STAR TREK The Next Generation. Published by Marvel Comics. No.23 7th December 1991. 38 pages of news,reports, interview and comic strip. Good clean condition. STAR TREK MAGAZINES. No 24 4th January 1992.36 pages of news, reports, features and comic strip. Grade: FN . Grade Notes: Light wear and creases to covers. Small creasing through right corners of magazine. The Grading Notes have been taken into account when assigning the above grade. They are are not all encompassing but are there to provide a higher level of detail and also for issues that may not be visible in the images. 72 page black & white publication covering a wealth of Sci-Fi material. Not Of This Earth - Special Edition. SUPERSTAR FACTS & PIX No.30. THE UNIVERSE OF. Condition - Item is new and is with magazine. Sealed - Yes.